A Plethora of Nails: Matte Foil? Yes Please! I tried out a new foil from Revlon, which I thought was very pretty. Then I decided to matte it, because I'd never done that with a foil. I LOVE it. I'm very addicted to matte. It's definitely one of my favs now too! Ooh this is nice! I love it both with and without the matte! How was the formula? I've had problems with Revlon in the past, but that was mostly with cremes. The application was great, but I definitely think that foils always seem to have good formulas. So far the only Revlon I dislike is Blue Lagoon. It was streaky and annoying! I just got Matte About You this weekend and I, too, am an addict. I love the foil mattified, I would never have thought to do that! It turns into a really interesting, almost creamy looking color... neat! Thank you! It does kind of look creamy! Very nice. :) Loving the matte. Never thought to matte a metallic. Kind of cool! Ohhh, I've never thought of matte-ing a foil! Looks neat. 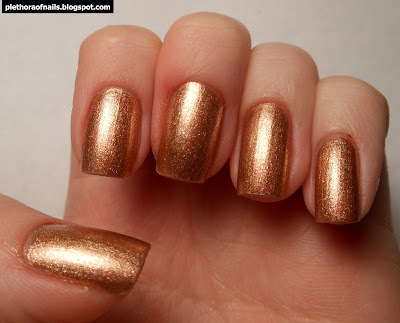 And I might have to pick up Copper Penny now- I've been eyeing it forever!